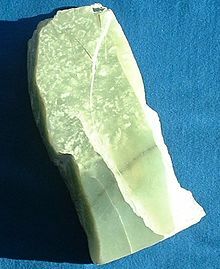 The English word jade is derived (via French l'ejade and Latin ilia "flanks, kidney area") from the Spanish term piedra de ijada (first recorded in 1565) or "loin stone", from its reputed efficacy in curing ailments of the loins and kidneys. Nephrite is derived from lapis nephriticus, a Latin translation of the Spanish piedra de ijada. 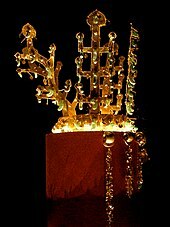 During Neolithic times, the key known sources of nephrite jade in China for utilitarian and ceremonial jade items were the now-depleted deposits in the Ningshao area in the Yangtze River Delta (Liangzhu culture 3400–2250 BC) and in an area of the Liaoning province and Inner Mongolia (Hongshan culture 4700–2200 BC). Dushan Jade was being mined as early as 6000 BC. In the Yin Ruins of the Shang Dynasty (1600 to 1050 BC) in Anyang, Dushan Jade ornaments were unearthed in the tomb of the Shang kings. Jade was used to create many utilitarian and ceremonial objects, from indoor decorative items to jade burial suits. Jade was considered the "imperial gem". From the earliest Chinese dynasties to the present, the jade deposits most in use were not only those of Khotan in the Western Chinese province of Xinjiang but other parts of China as well, such as Lantian, Shaanxi. There, white and greenish nephrite jade is found in small quarries and as pebbles and boulders in the rivers flowing from the Kuen-Lun mountain range eastward into the Takla-Makan desert area. The river jade collection is concentrated in the Yarkand, the White Jade (Yurungkash) and Black Jade (Karakash) Rivers. 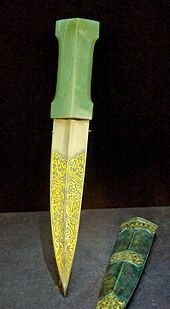 From the Kingdom of Khotan, on the southern leg of the Silk Road, yearly tribute payments consisting of the most precious white jade were made to the Chinese Imperial court and there worked into objects d'art by skilled artisans as jade had a status-value exceeding that of gold or silver. Jade became a favourite material for the crafting of Chinese scholars' objects, such as rests for calligraphy brushes, as well as the mouthpieces of some opium pipes, due to the belief that breathing through jade would bestow longevity upon smokers who used such a pipe. In the history of the art of the Chinese empire, jade has had a special significance, comparable with that of gold and diamonds in the West. Jade was used for the finest objects and cult figures, and for grave furnishings for high-ranking members of the imperial family. Due to that significance and the rising middle class in China, today the finest jade when found in nuggets of "mutton fat" jade – so-named for its marbled white consistency – can sell for $3,000 an ounce, a tenfold increase from a decade ago. The Chinese character 玉 (yù) is used to denote the several types of stone known in English as "jade" (e.g. 玉器, jadewares), such as jadeite (硬玉, 'hard jade', another name for 翡翠) and nephrite (軟玉, 'soft jade'). But because of the value added culturally to jades throughout Chinese history, the word has also come to refer more generally to precious or ornamental stones, and is very common in more symbolic usage as in phrases like 拋磚引玉/抛砖引玉 (lit. 'casting a brick (i.e. the speaker's own words) to draw a jade (i.e. pearls of wisdom from the other party)'), 玉容 (a beautiful face; 'jade countenance'), and 玉立 (slim and graceful; 'jade standing upright'). The character has a similar range of meanings when appearing as a radical as parts of other characters. The Jain temple of Kolanpak in the Nalgonda district, Andhra Pradesh, India is home to a 5-foot (1.5 m) high sculpture of Mahavira that is carved entirely out of jade. It is the largest sculpture made from a single jade rock in the world. India is also noted for its craftsman tradition of using large amounts of green serpentine or false jade obtained primarily from Afghanistan in order to fashion jewellery and ornamental items such as sword hilts and dagger handles. Archaeologists have discovered two forms of jade that can be found across Taiwan through the Philippines, East Malaysia, central and southern Vietnam, and even extending to eastern Cambodia and peninsular Thailand. These two forms are called linling-o penannular earring with three pointed circumferential projections and the double animal-headed ear pendant. The forms are very similar in size and range from about 30–35mm in diameter. Furthermore, radiocarbon dates have dated these forms in Southeast Asia from around 500 BC to 500 AD. The electron probe microanalysis shows that the raw material of these two types of artifacts was nephrite jade from Taiwan called Fengtian nephrite. Evidence recovered from multiple sites from Taiwan, the Philippines, and the mainland southeast Asia suggests that Taiwan was the main source of the exchange of this kind jade. During the Iron Age of Southeast Asia, there may have been skilled craftsmen traveling from Taiwan to southeast Asia along the coastline of the South China Sea, making jade ornaments for local inhabitants. Tools, weapons and ornaments were made of it; in particular adzes, the 'mere' (short club), and the hei-tiki (neck pendant). Nephrite jewellery of Maori design is widely popular with locals and tourists, although some of the jade used for these is now imported from British Columbia and elsewhere. Pounamu taonga include tools such as toki (adzes), whao (chisels), whao whakakōka (gouges), ripi pounamu (knives), scrapers, awls, hammer stones, and drill points. Hunting tools include matau (fishing hooks) and lures, spear points, and kākā poria (leg rings for fastening captive birds); weapons such as mere (short handled clubs); and ornaments such as pendants (hei-tiki, hei matau and pekapeka), ear pendants (kuru and kapeu), and cloak pins. Functional pounamu tools were widely worn for both practical and ornamental reasons, and continued to be worn as purely ornamental pendants (hei kakï) even after they were no longer used as tools. Jade was first identified in Canada by Chinese settlers in 1886 in British Columbia. At this time jade was considered worthless as they were searching for gold. Jade was not commercialized in Canada until the 1970s. The mining business Loex James Ltd., which was started by two Californians, began commercial mining of Canadian jade in 1972. Mining is done from large boulders that contain bountiful deposits of jade. Jade is exposed using diamond-tipped core drills in order to extract samples. This is done to ensure that the jade meets requirements. Hydraulic spreaders are then inserted into cleavage points in the rock so that the jade can be broken away. Once the boulders are removed and the jade is accessible, it is broken down into more manageable 10-tonne pieces using water-cooled diamond saws. The jade is then loaded onto trucks and transported to the proper storage facilities. It was not until 1863 that French mineralogist, Alexis Damour, determined that what was referred to as "jade", could in fact be one of two different minerals: either nephrite and jadeite. Both nephrite and jadeite were used from prehistoric periods for hardstone carving. Jadeite has about the same hardness (between 6.0 and 7.0 Mohs hardness) as quartz, while nephrite is slightly softer (6.0 to 6.5) so can be worked with quartz or garnet sand, and polished with bamboo or even ground jade.. However nephrite is tougher - more resistant to breakage. Among the earliest known jade artifacts excavated from prehistoric sites are simple ornaments with bead, button, and tubular shapes. Additionally, jade was used for adze heads, knives, and other weapons, which can be delicately shaped. Nephrite can be found in a creamy white form (known in China as "mutton fat" jade) as well as in a variety of light green colours, whereas jadeite shows more colour variations, including blue, brown, red, black, dark green, lavender and white. Of the two, jadeite is rarer, documented in fewer than 12 places worldwide. Translucent emerald-green jadeite is the most prized variety, both historically and today. As "quetzal" jade, bright green jadeite from Guatemala was treasured by Mesoamerican cultures, and as "kingfisher" jade, vivid green rocks from Burma became the preferred stone of post-1800 Chinese imperial scholars and rulers. Burma (Myanmar) and Guatemala are the principal sources of modern gem jadeite. In the area of Mogaung in the Myitkyina District of Upper Burma, jadeite formed a layer in the dark-green serpentine, and has been quarried and exported for well over a hundred years. Canada provides the major share of modern lapidary nephrite. Nephrite jade was used mostly in pre-1800 China as well as in New Zealand, the Pacific Coast and the Atlantic Coast of North America, Neolithic Europe, and Southeast Asia. 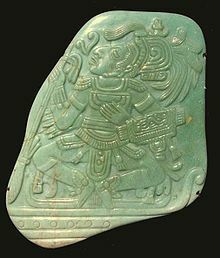 In addition to Mesoamerica, jadeite was used by Neolithic Japanese and European cultures.